Rose Cottage is a character stone-built cottage situated in the hamlet of D'Loughtane, near to Youghal on the County Waterford/ Cork border. The cottage can sleep five people in two bedrooms, which are made up of a double and a family room with a double and two singles as well as a family shower room The rest of the cottage is made up of an open plan living area with kitchen, dining area and sitting area with solid-fuel stove. To the outside is a large enclosed front lawned garden with a gravelled area and patio with furniture. Set in a stunning location, Rose Cottage is a great place for a good holiday at any time of the year. Situated on the estuary where the River Blackwater meets the sea is the seaside resort of Youghal in County Cork. Just across the water from this popular coastal destination is County Waterford, making this a wonderful spot to explore both counties. Today you can enjoy a stroll along the prom and gaze at the boats docked in the harbour. Swim or stroll along the sandy beaches, take a cruise along the Blackwater River, take a guided tour of the town or simply relax and enjoy the pubs, cafes and restaurants. Oil-fired central heating with solid-fuel stove. 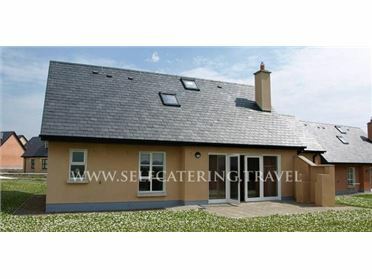 Electric oven, gas hob, microwave, fridge, washing machine, TV with Saorview, WiFi, selection of books. Fuel, power and starter pack for stove inc. in rent. Bed linen and towels inc. in rent. Ample off road parking. Enclosed front lawned garden with gravelled area and patio with furniture. Sorry, no pets and no smoking. Shop, pub and restaurant 3.5 miles. Coast 1.5 miles. Note: Max 4 adults. Note: There are Irish black bees in an apiary adjoining the owner's garden which produce honey which is available. .